Live Below The Line and Change the Way You Think About Food. I spend a lot of money on food because it brings me so much joy. I love growing food, cooking nice meals for my family and finding and eating good food – in restaurants, shops and markets. Yet so much of the world doesn’t get the same opportunity to enjoy food as I do. They can’t afford to go to restaurants and don’t have access to a wide variety of shops or huge supermarkets. They only have access to the crops they grow. I’ve met families in Kenya who survive on very small portions of the same basic maize meal every day and mums who go without food so their children can eat. 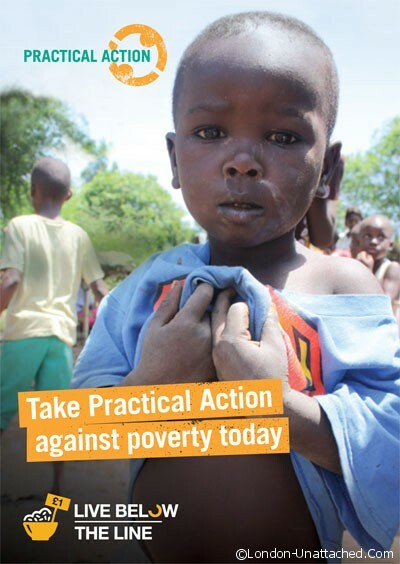 In fact, a shocking 842 million people in the world do not have enough to eat. So next week, thousands of people will be showing their support by signing up to the Live Below the Line challenge – living on just £1 a day for five days for all their food and drink, whilst being sponsored to raise funds to help these families struggling to survive. For nearly 50 years, Practical Action has been helping some of the world’s poorest communities to use simple, sustainable technology to find lasting solutions to disease, hunger and poverty. Today we are asking you to take practical action and join us by taking part in the Live Below the Line UK challenge from 28 April to 2 May and help men and women in desperate need. This event is not about replicating poverty or pretending that changing your eating habits for five days will give you an understanding of what poverty is truly like, but the intention is to start conversations, raise awareness and raise funds to help people living below the extreme poverty line. I’m ‘living below the line’ for 60 days and I will finish my challenge along with thousands of others doing the five day challenge on 2 May. It has been tough but the knowledge that it is temporary and the rewards that I reap in return will make it all worthwhile. Living Below the Line has changed my relationship with food. I’m not saying I’m going to live on rice and chickpeas forever (I’ll be honest – I can’t wait to have a glass of wine and a roast dinner) but it has drawn my attention to how much we take for granted and the absolute absurdity of the money we spend on food (myself included) when millions of people have to go to bed hungry every night. 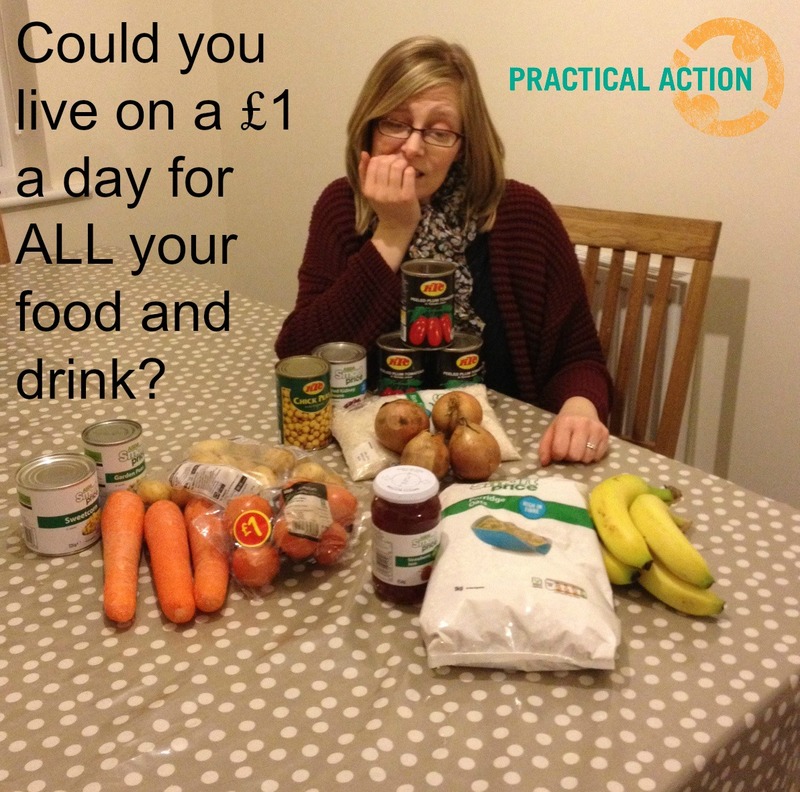 Could you take on the £1 a day challenge? Are you inspired by Gemma? Then sign up for Live Below the Line, You’ll find plenty of resources, recipes and tips to get you through the week at the Live Below the Line website. • Research food prices before you go shopping (try using https://www.mysupermarket.co.uk/) and spend your £5 in one food shop at the beginning of the week do your money goes further. • Go to the supermarkets towards the end of the day (around 7pm) to find some bargains in the reduced sections. • Encourage other people in your household or at work to take part. You can pool your money and make meals for each other. • Check out Gemma’s blog where there are loads of recipes and tips to help you have a successful challenge. also were you aware that your social media widget has lost FB & twitter ? I think this is a really good way to shed just a little light on what it must be like for so many people who have so very little. Such a great idea! I’m definately doing this next year! Hi Jasmin, it is a great idea isn’t it! I’d do it myself but I’ll be in Antigua (!!!) so, even if the food does only cost £1 a day it’s not really quite right. Gemma is doing it for a whole 60 days – quite amazing! This is a very good idea. Poverty is never real for those who are not in it. Go, Fiona!!! You have the recipes and the ideas. I am sure you can. We are currently staying with my father in law and he is very old fashioned and not willing to participate which makes it difficult but I will try for Clive and I when we are back home. I ACTUALLY did this in 2012 Fiona, and it was a very humbling experience too…..I managed to do it for the 5 days, with a small blip when I met a friend for coffee! It’s on the blog somewhere, must see just how well or NOT I did! Wow, that is tough! So, if Jonny & I were doing it, then we could spend £2 per day right? And you can’t eat anything from the freezer or pantry unless you factor in the cost? I am seriously considering it, but mildly terrified at the same time! PS way to go Gemma for managing 60 days!